This blog is about all the information required to start a a blog, blogging tips and tools for the beginners. Are you thinking of starting a blog for your business? Well, if you are, there are certain things you need to know first. Your business might not even need a blog. But you have probably heard times without number about how your business or industry website needs a blog. Blogging is a very lucrative and not to mention very valuable to a business, but not EVERY business. All you might end up needing is a good social media ad, business or eCommerce website. Most of the time, when people tell me that their business blog failed or isn't doing so good. There are three questions i ask them. 1) Are you reaching a targeted audience? 2) Are they potential clients? 3) What sought of business do you do? Business blogs are assets, but you need to really think about it being good for your blog. So, it won't turn out to be a huge waste of your time. You might start a blog or social media channel and the first thing you are doing is marketing your services, content or products to your friends. Even if your peers are business owners as well, the most you can get out from them are; advice, supports, and at best some referrals. Depending on your approach and content strategy, the tendency of your readers and peers becoming paying customers will be less likely. For example, a make-up artist that writes a lot of blog post about how to do make up like a pro. Majority of her readers will be people interested in learning how to make-up. Her readers may not even be in her country, now imagine going cross country to do a client's face. Now let that sink in, its not feasible right? thought so. Will other aspiring make-up artists want to hire her? probably not. There is nothing wrong offering business coaching to make some extra income. However, blogging about "how you do what you do" is probably not the right approach. For a make-up artist, there are some content ideas that would work well to driving in clients and not aspiring makeup artists. 1) Have a website that sells make-up tools instead. 2) Target a desired clientele, by writing blog posts on how to choose the right make-up artist. 3) Offer a paid one-to-one consulting services with aspiring make-up artists. 4) Get testimonials from past clients. The idea may seem cliché but marketing your designed services to similar service providers would eventually lead to the failure of your business blog. Learn how to attract the right clients. If you want to attract potential clients, they have to trust that you can handle what they are hiring you for. When starting your blog, ensure that you have all the necessary features set up, don't make beginners mistakes. Start growing your email list, add convincing and compelling reasons why readers should sign up. Also, don't forget search engine optimization (seo). Submit sitemap to google search console and robots.txt files. Submit sitemap to Bing webmaster. Fast ways to Index all your web pages. Internal linking: the SEO way. Blogs usually have a slow growth process. Don't write quality posts and expect that tons of people will start swooping in; like they have been waiting for you all their lives. Create awareness, invest a little in advertising. If you have a business location, add it to Google my business. Meanwhile, be sure your visitors have good navigation of your blog. They should have a good understanding of who you are, what you do and how they can work with you. Have an interesting look to your landing pages. 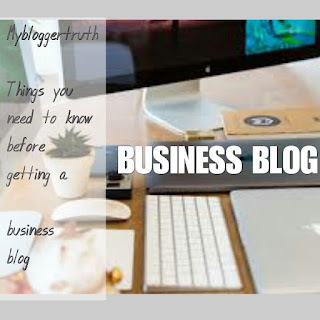 3) Set up Business accounts and link it with your blog. All with the aim of building trust, link your business social media accounts with your site. Your readers may want to get to know you better. This way, your audience can follow you on your social accounts and communicate with you easily on their most comfortable social platforms. Things keep changing and you need to keep evolving with your set blogging strategies. Be flexible not stagnant, don't be skeptical trying new ideas. Having innovative ideas can be extremely helpful to your business. It is capable of taking your business to a whole new level. Tweak up your existing blogging strategies, if it is not yielding favorable results and not working for your readers. Experiment with several blogging strategies and find out which one works for your audience. It may be a new strategy never being tried by anyone before or well-known strategies. Blogging is something that you may enjoy, but only profitable with and only with the right approaches. Research on the right strategies to put your business in the right market from the beginning. Be the supplier and your audience demand. When all grounds have been covered, you can then proceed to start a blog for your business. I wish I knew all these before starting my business blog in the past. Hope these tips will be useful to you and your journey towards having a successful business blog. I have been blogging for a while now,reading your post, I can see where I`m going wrong, why there is barely any traffic, my posts are not well targeted to my potential clients.Brilliant post. Thanks, I'm glad you gained something from it. This is a really good point ! Too often we try to do everything! It's important to focus on the right things that you believe will benefit you the most. Trying to do everything may lead to the downfall of your business. I have been blogging for a while and doing pretty well, but the one thing I still haven't focused on is the email list-- my next area to expand! Building an email list is something one should start doing from the beginning. It turns new users into returning users. Goodluck Gina, success all the way. I am new at blogging and those are some valuable advices! Thank you! Thanks for following me on g+, I got to know you through that, followed your link to discovered this your awesome blog. There something that I am so particular about, and that is, when I hoover my mouse on the featured image in your blog post, it displayed social media share buttons. How did you do that please? Your reply will be highly appreciated. Love it - thank you. I'm a beginner, and find your info clear and useful. You're welcome Elina. I wish you well. Media.net vs Infolinks:Pros and Cons, which pays better? Join 3,159 email subscribers who alreadyy trust Mybloggertruth for quality blogging tips.